I'm an Associate Professor of Philosophy at the University of Dayton. I represent no one but myself, and barely do that. I'm here mostly by accident. I'm coming back . . . .
Well, gentle reader, as you know, I haven't been doing much here. me little opportunity to write anything here. As you might imagine, someone who gets a Ph.D in philosophy—in addition to various other psychopathologies and deep maladjustments—drinks (or has drunk) a lot of coffee. I know I have: from the coffee shop in the basement of the Regenstein Library at the University of Chicago, as well as the late The Flying Lox Box ("Now Serving Nobel Laureates! "), Morry's, and the coffee shop at the Divinity School, and even vending machines, I drank a lot at UC. I actually think the availability of coffee at a University is an important sign of its academic seriousness (that, and good graffiti in the bathrooms); it should be decent (not necessarily great), and available at least from 6 a.m. to 2 a.m.. Chicago had this, but I'll be honest and recognize that the best graffiti I've ever seen were (yes, it is plural) at the Stanford Undergraduate Library. At the University of Dayton, coffee is often unavailable all weekend (except from vending machines, which doesn't count under the "decent" criterion), and certainly late at night or very early in the morning. As much as I love the Philosophy Department here, I do believe it has the worst coffee I've ever had (thus, I prefer stealing it from the English Department, enduring steely glares and hostility, even though one Barb Farrelly told me I could until I retired). Draw your own conclusions about academic seriousness. 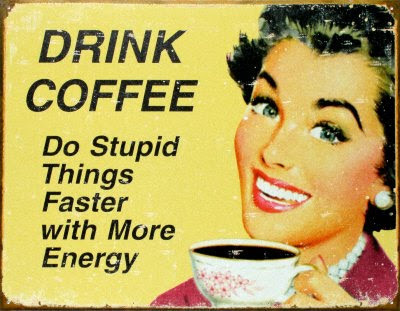 But I am also willing to drink a fair amount of instant coffee: it's decent, and definitely fast. (I haven't tried the Steven Wright trick of putting instant coffee in the microwave to see if I go back in time). Thus I recently tried "Via," the new instant coffee offered by Starbuck's. (When my wife Robyn and I hung out at the local Starbucks, and became friends with the baristi, they came to one of of our parties and made fun of the fact that I had instant coffee; I now savor the ironies like a good Kenyan Peaberry.) Ten packs for ten dollars: extensive calculations indicated that a cup of their instant coffee is $1/cup. Maxwell House--as Preston Sturges might put it, "good to the last gulp"--is approximately a nickel a cup. And having sampled a fair amount of both, I'm confident that Via is better, marginally; but that margin is hardly 20 times better. I'd say about twice as good? So I say "adio" to Via. My friend Richard, who now teaches at a campus that prohibits coffee (you can make your own in your office; draw your own conclusions, again, about the academic seriousness of that place), and I once went to an Afghan restaurant in Chicago. The food was okay, and then we ordered coffee. Absolutely out of this world, and easily the best cup of coffee I'd ever had (and then had about thirty). Sadly, the Helmand went out of business in 1987. It was the reigning champ all these years, until Robyn took me to the Strip in Pittsburgh. While she shopped, the kids and I went to a coffee shop and I ordered a cup. The barista fussed and fumed, and it took what seemed like a very long time, and it all seemed rather pretentious. Then I tasted it. Knocked me out, blew me away: the new champ. Turns out that a good bit of their excellence comes from the coffee they use (what a surprise! ), a brand called "Intelligentsia." Admittedly, there is a lot of pretense and silliness in all of this, and when you hear about licorice leading to a mango and charcoal laced after-finish, well, I sometimes think maybe I'll just go back and talk to my wine snob friends, who sound even sillier. But the bottom line is that the best coffee I've ever had in my life was at this place in Pittsburgh. And that, my friends, is an important thing to know. Just when you thought the 2009 postseason umpiring couldn't get any worse, Tim McClelland goes ahead and makes what ends up as the worst call — or non-call — of all time. Yes, you read that right. The worst call of all time. Not just this postseason. Not this entire season. Not this decade. Not this century. I challenge you to think of one that was worse. At this point, not even Kanye West could interrupt to suggest something worse after McClelland left the entire baseball universe shaking its head at his work during the Yankees' 10-1 victory over the Angels in Game 4 of the ALCS. Don Denkinger. 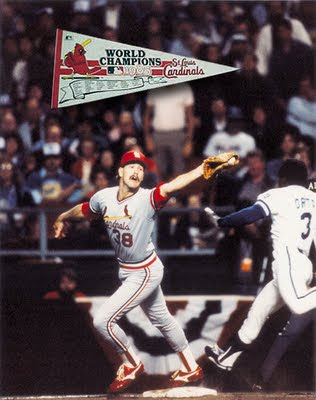 Game 6 of the 1985 World Series, St. Louis against Kansas City. Bad call. Very bad call. Obvious when it was seen live. More obvious when seen on a replay. Was it technically as bad as McLelland's? Perhaps not; not as complicated, certainly. But it would have been the first out of the ninth inning of game 6. Had the call--an easy call, mind you--been made correctly, the Cardinals would have only needed two more outs to win the Series. Denkinger missed a call Helen Keller could have made. The Cardinals proceeded to lose their minds, lose the game, then get blown out in Game 7. I claim that is a worse call. I welcome other candidates. I should add that Denkinger doesn't deserve getting death threats (which he was still getting, just a few years ago). Those should probably stop now. For those of you who know me, I'm somewhat of a Cardinals' fan. They had what might be their most agonizing loss I can remember; the only competitor is Game 6 of the 1985 Series. That had more significance, being in the World Serious and all. But tonight reminds me of what a great game it is, that can produce such exquisite torture. And the preemptive comment for my Cubs fan reader(s): I'd rather lose in embarrassing fashion in the post season than not be there. And I remember my team winning a World Series. Perhaps--if you're old--your greatgreatgrandparents remember the Cubs doing so. So shut up. The local city "alternative" (right) paper solicited articles for new columnists. I tried. The guy at the paper couldn't open one attachment, then a different kind of attachment, or (apparently) didn't like the version I sent as an e-mail. Indeed, he never really even responded. So here was my audition, for what it is worth. The debate over Swine Flu/AH1N1 brings with it what may well be three ideas essential to American political history. Oddly enough, it isn't entirely clear that those three ideas can be reconciled. But it is always fun to see people try. First of all, Americans don't like to be pushed around. Americans especially don't like to get pushed around by their own government. From Christopher Gadsen's iconic "Don't Tread on Me" flag, all the way to Ron Paul's quixotic Presidential campaign, there is a strong libertarian streak running through American history. We don't want to be told what to do, where we can do it, or (with some exceptions) who we can do it with. Second, there is the legitimate expectation that some things will be taken care of. We expect an ambulance to come when we need it, or someone to show up to help out if we discover that our house is on fire. Even most libertarians recognize that some kind of apparatus needs to be in place to ensure that contracts are enforced, citizens are protected against fraud and violence, and that national boundaries remain sacrosanct. Third, we expect—or hope—that whatever decisions we feel comfortable with the government making, they will be made by experts. In short, important policy decisions should be made by those with the best training and the best information, coming to conclusions that lead to the best possible results for all involved. So the government wants Americans to get themselves vaccinated against this current strain of flu. The President's Council of Advisors on Science and Technology has offered a number of policy recommendations, including increasing the availability of the supply of vaccine. They've also recommend people wash their hands more, and that employers adopt an approach to absenteeism that will make their workers more likely to stay home if they exhibit flu symptoms. This hasn't prevented some of the teabaggers, and those who live in the alternate reality sometimes known as "GlennBeckistan," from warning of "Mandatory Swine Flu Vaccinations This Fall." Internationalists (Socialists), in league with the World Health Organization (Socialists), abetted by the Executive Branch (Socialists), are putting in place their program to force Americans to endure risky and untested vaccines, as part of a program either to control their minds, or bodies, or perhaps just to distract us from recognizing the imminent Socialist takeover. At least for those unable to distinguish between Kim Jong-Il and Barack (Hussein) Obama. The government announcing, on the basis of "experts," a policy of mandatory vaccinations, would indeed be pushing us around. That this isn't the case might be a factor to consider. We also confront here an idea already mentioned: sometimes we do want government to take care of us. Minimizing the amount of rat excrement in our hamburger rarely evokes panicky cries of an impending Nanny State. As usual in such debates, it often depends on who, or what, is being pushed. The state, determining that you may not marry your life partner, is for some being pushed around by an intrusive government, while for others it is the sacred duty of the state to maintain a specific "tradition" of marriage. The state, being able to identify, arrest, try, convict, and imprison or execute even its own citizens is for some a legitimate responsibility of the government, while others might make (ineffectual) gestures of the violations of both civil and common law involved. Fundamentally, what we should expect of the government in its response to the flu pandemic (as declared by the WHO) is to determine the threat involved, and if the response is proportional. While some talk as if AH1N1 is indistinguishable from Ebola, others seem to regard it as no threat whatsoever; unsurprisingly, the truth seems to lie somewhere in between. As of September 5, there were 593 deaths attributed to H1N1 in the U.S., 2,837 in the world. Given its contagion vector, these numbers will go up, although how far seems to be a matter of conjecture. As one might expect, those at risk of succumbing to this virus are the very young, the very old, and those with compromised immune systems. In Ohio, students are required to be inoculated against a variety of diseases, including diphtheria, tetanus, pertussis, polio, measles, and the scary-sounding Haemophilus influenzae; exemptions based on religious or other grounds are available. Rather than scurrying to find "experts" who confirm our hopes (or fears), perhaps it makes more sense to see what the threat is, and with the best information available, respond accordingly. AH1N1 isn't polio, but is a threat sufficient to recommend vigilance. Offering some degree of limited liability, encouraging practices that minimize its spread, and avoiding exaggerating or minimizing the dangers, is precisely the kind of sensible approach the Obama Administration is encouraging. But that's a difficult position around which to energize knee-jerk reactions. Ok, I was supposed to read Hegel. Or was it Middlemarch? I can't remember: both too long to capture my attention. So I watched some movies, I read a bunch. Some of both have been forgotten, but I'd love to hear my reader's (or readers') thought (or thoughts) about anything below that sounds familiar. One shout-out: most of these were pretty great, I thought. But Ritter's The Glory of Their Times is still, for my money (and the money of many others!) the single best baseball book ever written. Cannot possibly recommend it too highly. In contrast to what a number of conservatives believe, liberals (or "liberals") aren't out to get your guns. There will be murmurs about fully automatic weapons in the hands of junior high students being a bad idea without a waiting period, or "cop killer" ammunition being available in vending machines in bars also being, well, not a great idea. But for the most part, the "liberals" (and especially the Democrats) have given up on this issue. Repeat after me: they really don't want my gun(s). They might make it somewhat more difficult to check out of an insane asylum and buy an AK-47 at a drive-thru on the way home (or to the victim's home), but that's about the only obstacle you'll see from the "liberal" party. Indeed, we really never seem to hear much about murder, guns, violence and other things, as if they pose a problem we might want to solve, or at least address. Odd: was it Eldridge Cleaver who said that violence is as American as apple pie? The conservative wings of both parties respond, well, that's right and that's the way we are going to keep it. There are no solutions to violence in America, except to make sure you are better armed--in church, at school, wherever--than your potential adversary. So the Democrats seem to have given up on guns as an issue. Is it possible the Republicans may give up on gay marriage as an issue? A couple of recent news items, one a poll (from the "Values Voters" [which means, for me, "people who don't have your values," not that they have values and I don't]) that indicates gay marriage is way way behind abortion rights as an issue; it came in third. A second, polling (I think) Iowa Republicans, indicates that >90% said gay marriage changed nothing in their lives. Wow. A truism that comes true. I suggest the first question every minister, priest, rabbi, imam, lawyer, and psychotherapist ask a couple (a heterosexual couple) whose marriage is in trouble is this: is it because of gay marriage? Then we can get some good, hard data.